Do these these situations sound familiar? You post a vacancy announcement and scores of resumes arrive by mail, email, or fax. Most have different layouts, and you have to study all of them to select the best candidate. You need results ASAP, and you should be prepared to justify your selection. Your firm is bidding on a contract that requires people with special skills and experience. You are under time pressure to finish the proposal, and you need to know who in your firm has what capabilities. 1. In your vacancy announcement, instruct your applicants to submit Generic Resumes and give them the links to download it. For more information and sample text, click here. 2. The applicants download, install, and run the form package. For more information, click here. 3. Once the applicants finish copying and pasting their resumes into the forms, they save them and email them back to you. 4. 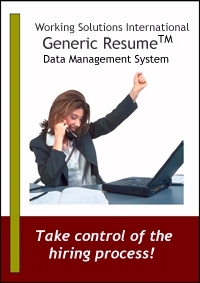 You use the Generic Resume Reporting Tool to harvest and analyze the resumes. You have 22 text reports, 10 graph reports, and an ad hoc query engine, where you can make your own selection criteria and save them. For more information -- including a video demonstrating all aspects of the reporting tool -- click here. Generic Resumes are better than resumes received by paper, fax or email because they are immediately organized and profoundly searchable. Employers will save time evaluating resumes. The system is superior to using resume search engines because Generic Resumes can be searched with precision. A Generic Resume can contain up to 45 fields for searching, whereas an ASCII resume, dropped into a search engine, is only one field. The system is superior to web-based resume application forms for both recruiters and candidates. For recruiters, the system, at $249.00, is far below what someone would pay for an online database system, and full implementation happens in days, not weeks or months. There is no contest here. Candidates also benefit because Generic Resumes are reusable. Candidates do not have to go from one website to another to fill out forms. Reusability is especially helpful in job fair environments. Instead of paper resumes, employees can bring generic resumes on a portable storage device, such as a CD. With it, they can pass their Generic Resumes from employer to employer, and that employer can build his own unique database of talent.